Planning to travel? Need a reunion getaway after a long deployment? We recently had the opportunity to travel to Petoskey, Michigan for an extended weekend getaway for an anniversary (can barely count the number on both of our toes and hands)! What a great time and we saw some new parts of the world we had never seen before! We have lived overseas in Central America and Iceland and visited South America, the Caribbean and Europe. We have also lived in numerous US states from the Puget Sound of Washington to the Low Country of South Carolina. After retiring from the Air Force we relocated to Michigan to be near the family we had air dropped here during our many moves. So we have been regular travelers and enjoy seeing new areas, finding new restaurants and just enjoying life while traveling. This time we stayed closer to home and still found something new and fun! Petoskey is right on Lake Michigan and is a bit of shop town for visitors and has a wonderful gas light district with numerous restaurants to choose from! We found several great ones including Chandlers, City Park Grill and Staffords Bay View Inn. All were friendly and the food was delicous. We had planned to visit Mackinaw Island on one day but the weather did not cooperate and we elected to proceed up to Sault Ste Marie to see the Soo Locks instead (flexibility is the name of Air Power). The locks are one hour north of the great Mackinac Bridge over the waters connecting Lake Huron and Lake Michigan. 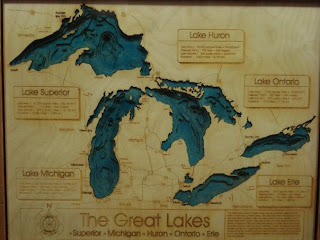 At the visitor center for the Upper Pennisula of Michigan we found a friendly welcome and a great recommendation for a restaurant overlooking the locks. The Soo Locks connect Lake Superior and Lake Huron and allow ships to move heavy loads of iron ore, etc from the north to the Midwest industrial areas. We sat in the Freighters restaurant and watched for ships and had a super sandwich and soup. The restaurant is named after the captains of ships who would eat there while waiting for their ships to transfer through the locks. After lunch we drove up the coast of Lake Superior and visited an old lighthouse which was gorgeous. We found a great boardwalk type trail along the lake but unfortunately the wind and sand blasted us when we turned around to head home (adding to our humor and memory of the event of course). We had a great weekend and used some of our travel points with a hotel chain we frequent! Have you joined at least one? With all the military and family traveling that you do, a membership (they are free) for hotel families such as Hilton, Marriott, Holiday Inn, etc is a great way to save for a getaway like ours! Safe travels and God speed! Have a favorite getaway location? Tell us about it by commenting.